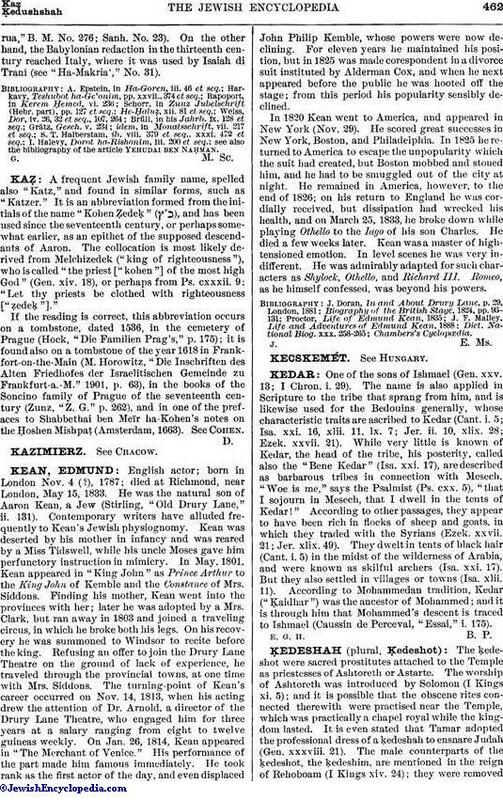 A frequent Jewish family name, spelled also "Katz," and found in similar forms, such as "Katzer." It is an abbreviation formed from the initials of the name "Kohen Ẓedeḳ" ( ), and has been used since the seventeenth century, or perhaps somewhat earlier, as an epithet of the supposed descendants of Aaron. The collocation is most likely derived from Melchizedek ("king of righteousness"), who is called "the priest ["kohen"] of the most high God" (Gen. xiv. 18), or perhaps from Ps. cxxxii. 9: "Let thy priests be clothed with righteousness ["ẓedeḳ"]." If the reading is correct, this abbreviation occurs on a tombstone, dated 1536, in the cemetery of Prague (Hock, "Die Familien Prag's," p. 175); it is found also on a tombstone of the year 1618 in Frankfort-on-the-Main (M. Horowitz, "Die Inschriften des Alten Friedhofes der Israelitischen Gemeinde zu Frankfurt-a.-M." 1901, p. 63), in the books of the Soncino family of Prague of the seventeenth century (Zunz, "Z. G." p. 262), and in one of the prefaces to Shabbethai ben Meïr ha-Kohen's notes on the Ḥoshen Mishpaṭ (Amsterdam, 1663). See Cohen.